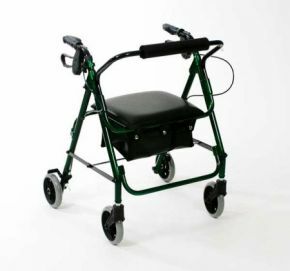 When you’re shopping for a rollator, it’s easy to get overwhelmed by the sheer number of products on the market. Here at the Active Mobility Centre we stock a wide range ourselves! However, if you’re looking for a straightforward lightweight walker with bag, perhaps consider this one. It’s value for money, but doesn’t skimp on features! Made from aluminium and with four wheels, this rollator is both lightweight and easy to manoeuvre. It folds easily making storage and transportation easy, and comes complete with an underseat bag. With easily accessible brakes, adjustable height pushing handles, a cushioned safety bar/backrest and a lightweight frame, perhaps this is the one you’ve been looking for. Führung It very helpful, havent been able to venture out for weeks, frightened of talking. Ideal for mum. She was struggling with her walking and was having panic attacks as a result. She's only used it three times and her walking is already much more confident. One star off as when it folds there's no way of keeping it folded so it tends to just open out again, which makes it very difficult to get into the car.